The pie-flinging, pinstripe-wearing, pint-sized classic has finally made it to the Garage Theatre stage in this adaptation of the hit film. A cast of Co. Monaghan youngsters play Prohibition-era mobsters in this tongue-in-cheek tribute to the 1920s gangster flick. It seems Fat Sam (Martin Mc Elroy), who runs one of the most popular speakeasies in town, is in danger of being closed down by his "business rival" Dandy Dan (Dale Creaney). 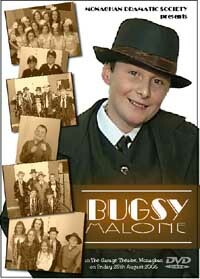 Enter baby-faced Bugsy Malone (David Mc Caffrey), a killer with the ladies and a definite asset to Fat Sam. Unfortunately, Bugsy has also caught the eye of Sam's girlfriend Tallulah (Michelle Hurson) �?though he's set his designs on the showgirl Blousey Brown (Lisa Mc Cabe).As in the film, the "non-violent" gang war is fought with "splurge guns" which spew forth custard pies instead of bullets. It’s a thoroughly charming, irreverent and clean (though very messy) showcase for a cast of talented young performers,.